Despite decades of progress in recycling, the amount of garbage in America continues to escalate--due in part to a growing population, and in part to growing per capita consumption: the amount of stuff the average person buys, uses for a time, and discards. 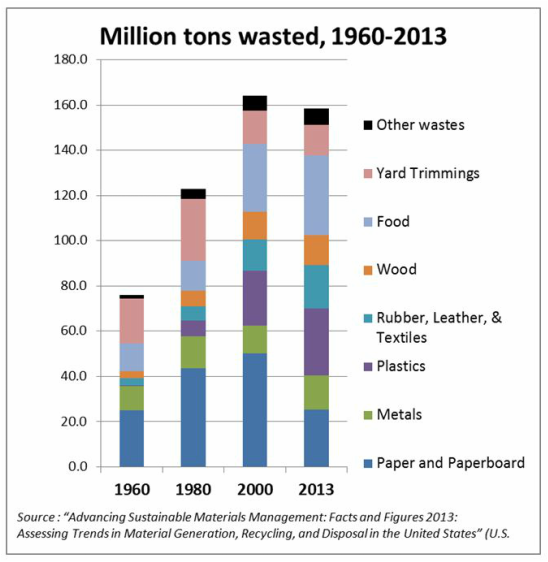 As the chart below shows, back in 1960, about 75 million tons of material were being wasted--not recycled--in the U.S. each year. By the turn of the millenium, this number had more than doubled, to 166 million tons a year. In the decade and a half since, recycling and composting efforts have taken only a small bite out of that number: each year, we still waste (landfill, incinerate, or litter) almost 160 million tons of material that could be used again. ​This includes over 25 million tons of paper and cardboard, 8 million tons of glass, 15 million tons of metals, and almost 30 million tons of plastics--all of which could be recycled into new products, but instead must be "replaced" with virgin materials--through industrial processes with many environmental and and social effects--including soil erosion, air and water pollution, loss of habitat, the disruption of human communities, and greenhouse gas generation that leads to climate change. As disturbing are the 35 million tons of food wasted in our country annually--much of which is edible. Finally, despite the adoption of thousands of yard waste composting programs throughout the country, we still throw away over 13 million tons of grass clippings, leaves, weeds, and brush. The decay of organic matter in landfills creates methane, a potent greenhouse gas. If the 48 million tons of food and yard waste had been composted instead, an estimated 33 million tons of greenhouse gas emissions could have been avoided--that's like taking 6 million passenger cars off the road for an entire year. *Measured in metric tons of carbon dioxide equivalents. 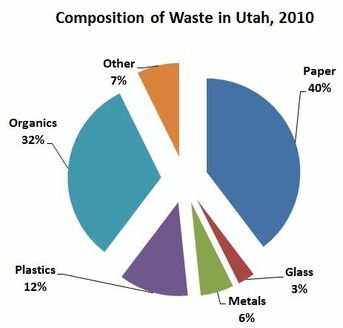 How much do Utahans contribute toward the waste? The Utah Department of Environmental Quality estimates that 3.7 million tons of waste were generated in the state in 2010. The pie chart shows the components of the waste generated. According to a survey by BioCycle magazine, an estimated 5% of this waste is recycled.